It's so sweet to be recognized with awards for my blog - I really do truly appreciate them! My very fabulous friend Kim from Homesteader's Heart gave me this award. Thank you so much Kim!! Isn't that the cutest award? I'd like to pretend that it's me in the picture - but I weigh A LOT more than that gal and my dog is a big ol' basset hound - wouldn't make for a very elegant picture - LOL!! 2. Hugs from hubby and son. Aren't hugs wonderful? Now I'm not putting down kisses here, but there is something special about a hug. 3. Chocolate. Yeah, I'm pretty sure you had an idea this might make the list - LOL! 4. Blogging. I really enjoy it and the friends that I have made! 5. Housecleaning - oh LOL - you KNOW that is a joke, but I couldn't resist!! I think it's a tie between tea, fancy coffee drinks, desserts, yummy recipes, and cookbooks! 1. Katy Lin at The Great Adventure - She is a sweet newlywed with a BIG heart for Jesus and hosts My Husband Rocks on Fridays. 2. Alicia at Confessions of a Snowflake - She has a lovely blog with beautiful, thought-provoking posts and sometimes shares pics of her cute cat. 3. Ashley at Livin Our Love Song - She posts about family and shares delicious coffee drink recipes (she and hubby have a coffee house). You should look back over the last month and check out all her wonderful homemade gift ideas - you could use them throughout the year. 4. Susie at Susie's Homemade - Yum! She has lots of wonderful food pics and recipes. Always fun to see her entries in a cupcake contest - she makes the cutest creations! 5. And back to Kim, but for her yummy cooking blog - What's Cooking at My House - She has lots of good recipes to check out. Not only are they super yummy, but she tries to make them a little more nutritious. 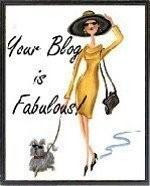 Those are definitely some fabulous blogs and I encourage you to check them out! Have a blessed week and a Merry Christmas!! Wow!! Thanks for award!!! What a great Christmas present:-) Have a great holiday!!! I got your fabulous card today!!! You are a good looking family my friend. Thank you so much for the lovely note as well. It certainly did warm my heart!! !My husband is floored at all the love some of you gals have shown. I said yeah it's weird but even though we haven't met we feel close. Thanks for being my friend!! !